Yep, folks, I'm pulling the plug tomorrow! Before you think I'm nuts, let me explain why this is a great decision for me (not for everyone). Social media is such a fickle beast. Yes, you like to keep up with friends and family, but when your first waking thoughts are about scrolling through your news feed, instead of grabbing some quiet time with God, it's time to quit it. For me, it was a stumbling block in my daily Christian walk. Psalm 1:2 says, "But his delight is in the law of the Lord, and on it he meditates day and night"
It doesn't say, to meditate on everyone else's life, or worrying about getting that perfect photo to share on your social media, day and night. And that's where my problem was- trying to keep up. I have enough to deal with between putting energy into my family and close friends, keeping up my home, keeping up the Etsy shop, keeping up with this blog, keeping up with all the doctor's appointments, medications, physical therapists, keeping up with the time I should have my nose in the bible, keeping up with the classes that will get me to a Theology degree, and doing all of this with Fibromyalgia and Endometriosis. And what's the purpose, really? To keep up with folks? I do want to keep up with my friends and family, but do I want to keep up with my 300+ acquaintances who I haven't spoken to in a good 15 years or more? No, thanks though. Snail mailing me- yes, you remember how to address an envelope, don't you? And ya know what? My life will be less cluttered because of this decision. I won't have to worry about getting offended by what someone puts on their walls. I won't have to worry about the friendship politics of making sure I "Like" some one's hundredth selfie of the month or they will think I'm mad at them. I will no longer have to stress about when something big happens in my life, making sure I put it on Facebook, Instagram, Twitter, Blog and Bloglovin'- it will simply go here, or you can hear about it directly from me. Some may say that if you want your blog to be successful then you MUST be super active on all social media accounts. I say that I'm not in this for a huge following. I'm in this to share parts of my life with others who are interested in what I have to say. And some may say that I will get less "Sponsored Posts" from companies who want me to showcase their goods for exposure. To that, my response is this- I started this blog to share my story of overcoming my health conditions, to share our love of travel with folks, and to hopefully inspire people who may be searching the web for answers to questions they don't dare ask aloud. So, does social media get in the way of that? For me, yes, it does. 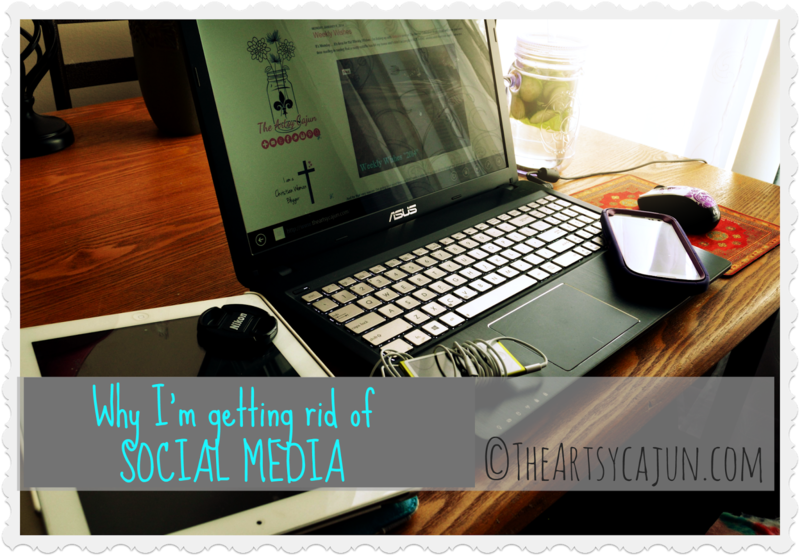 I spend more time on social media than I do actually working on the blog. And that doesn't help my original goals for this space. It actually hinders it. No, I don't think social media is bad. I do think, however, for me it was time consuming and it distracted me from the really important things in life. You've read about me wanting to "Simplify Everything" this year, and how I am "Konmari Method"-ing my home, but I want to do the same with my life... my time. I let insignificant things get in the way. So, by taking said insignificant things out of the equation, I will have more time for the things that DO matter to me. This isn't to convince you of anything. It's more for the purpose of giving you the answer when you can't find me on social media. Oh, but I will be keeping Pinterest. I might be crazy to give everything else up, but I'm not crazy enough to give up Pinterest! Glad you are doing what is best for you! You will be missed! GOOD FOR YOU!!!!! You will be hearing from me - I promise. Take care of and do what's best for you and don't worry about others. Girl, you are brave! I've tried cutting back but never completely deleting everything. Anyway, I NEED your phone number :) Love you, sister! I totally understand it... it can be so overwhelming. Awesome! I've been planning to do it too! I started with IG. Still have the account but haven't posted anything for awhile. I looked for you on FB today because I wanted to see how you were doing. I thought something was wrong on my end. Anyhow...I'm glad that you are doing what you think is best for you. I'll be paying attention to what you post here because it's the only way that I have to chat with you, besides Pinterest. Who knows...this may be the perfect way to drive tons of traffic to your blog...it's officially exclusive content :) take care and I wish you the best.